The Christmas season has official begun in our home. Aside from the advent calendar, we have been holding off on decorating our home for Christmas. Last year we got anxious early, and started decorating right after Thanksgiving. But this year we decided to hold off a little longer. The anticipation for a three and a half year old is just too much. We’ve already had several crying fits–"I can’t wait THAT long until Christmas…" or "But I just want my Christmas presents now…" Now that the number of days until Christmas is within a range that she can count to, it is much easier to wait. So Saturday we made the short trek to our new favorite Christmas tree farm. It is an old red barn in the middle of nowhere surrounded by fields and fields of Christmas trees of all species. 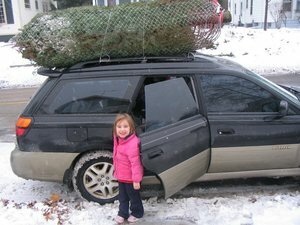 The trucks in the parking lot have bumper stickers that say things like, "Real trees make scents" and you are greeted by friendly tree farmers who give you an axe, a tree sled and a cup of hot apple cider. This year as we started the hike up the lane into tree wonderland, a scene straight out of the pages of Martha Stewart, both girls were hit with a blast of arctic Wisconsin winter wind that sent Emma screaming and Mary gasping for breath. So we parted company with Dan, who made the hike into the woods alone, while we girls headed for the warmth of the barn to pick out ornaments. I’m not sure who had the harder job–Dan cutting and hauling a chubby balsam fir down the snowy lane, or me, trying to keep two toddlers occupied inside a barn filled with fragile tree ornaments, glass bulbs, porcelain angels, and customers milling about holding cups of hot cider. I don’t know the struggles Dan faced out in the field, but I had my hands full. Both girls decided to test out some of the wooden toys for sale in the shop, in particular the wooden fishing poles. Any long wooden stick in the hand of a 20 month old who’s killing time in a room of fragility is not for the faint of heart. From there it was Emma’s urgent need to use the bathroom which meant trudging back outside in the snow to the outhouse. Yes a real, hole in the ground, don’t lean too hard you might tip it over, outhouse. Of course there was some trauma when emma peered into the hole and began asking questions. But the real trauma hit, when her cheeks hit the toilet seat which was covered in a thin film of ice. –choose to cut on a day when the temp is above 20deg. we wait a bit too, everyday – hearing the ‘when is christmas’ question is too much to handle. thank you for taking the time to visit and comment on my blog – have a merry christmas.